If you would like to read the first part in this article series please go to Virtualization in Windows 8 - What is it Good For? (Part 1). In the first part of this article series, I explained that Microsoft has finally abandoned Virtual PC and instead made Hyper-V available on the desktop. I spent the better part of that article running down the history of Microsoft desktop level virtualization and talking about the hardware requirements for running Hyper-V on Windows 8. In this article, I want to wrap things up by talking about how you would enable Hyper-V in Windows 8 and about some of the benefits of running Hyper-V on the desktop. Hyper-V isn’t installed by default. It is enabled through the Control Panel as a Windows feature. 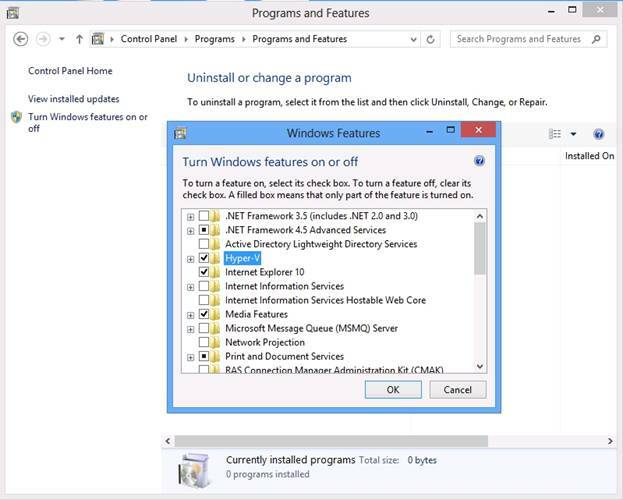 You can install Hyper-V by opening the Control Panel and clicking on Programs | Programs and Features | Turn a Windows Feature on or Off. When you do, you will see a list of the various Windows features. Simply select the Hyper-V option from the list, as shown in Figure A, and click OK. Your computer will need to be rebooted as a part of the installation process. Figure A: Hyper-V is installed as a Windows 8 feature. Once Hyper-V has been enabled, the Hyper-V Manager and Hyper-V Virtual Machine Manager tiles appear on the Start screen, as shown in Figure B. 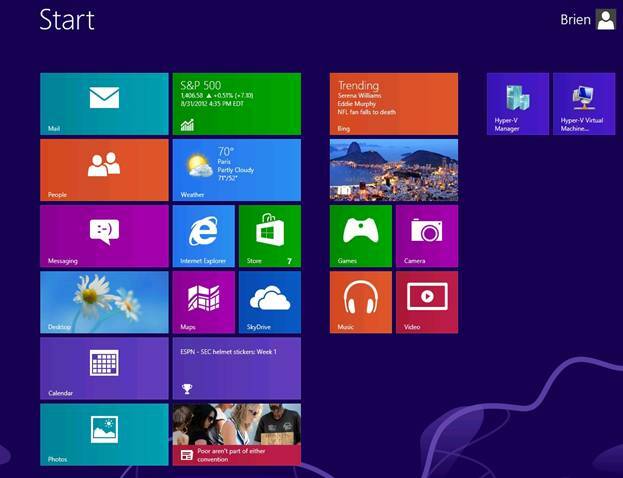 Figure B: Hyper-V related tiles appear on the Windows Start screen. 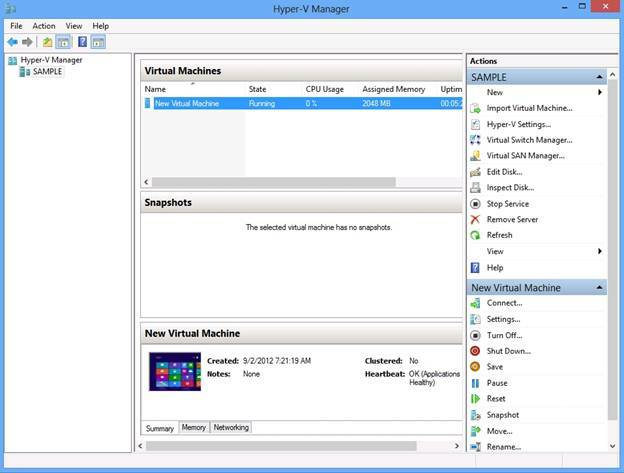 The Hyper-V Manager, which you can see in Figure C, is the primary tool for managing Hyper-V. The Hyper-V Manager console works almost identically to the way that it does in Windows Server 2012. Figure C: The Hyper-V Manager is the primary tool for managing Hyper-V.
Now that I have shown you how to deploy Hyper-V on the desktop, I want to wrap things up by talking about some of the benefits of having a desktop version of Hyper-V.
As I mentioned in my previous article in this series, Hyper-V replaces Windows XP mode in Windows 8. On the surface this probably seems like a bad thing, especially when you consider that Windows XP mode was able to seamlessly present applications on the Windows 7 desktop even though those applications were actually running in a Windows XP virtual machine. Even so, Hyper-V can be used as a Windows XP mode replacement – at least to some extent. It is possible to run Windows XP or virtually any other X86 / X64 operating system within a virtual machine. Even though running Windows XP in a Hyper-V virtual machine might not deliver the seamless experience that Windows XP mode did in Windows 7, it still gives users a way to run Windows XP applications. Realistically though, you probably won’t even need to create Windows XP virtual machines. So far all of the applications that I have tested that were designed for Windows XP seem to run fine on Windows 8. That isn’t to say that every Windows XP application will natively work with Windows 8, but so far Windows 8 does seem to be doing a good job. Besides, Windows XP is over a decade old, and it really is time to start moving to something a bit more modern. Running Hyper-V on the desktop can be great for testing and development. Hyper-V makes it possible to create a full blown development lab without having to build a dedicated virtualization host. Network administrators can even use Hyper-V on the desktop to create gold images of virtual desktops to be used by end users. Unfortunately, Windows 8 won’t let you live migrate a virtual machine from a Windows 8 host to a Windows Server 2012 host, but you do have the option of creating a virtual machine on the Windows 8 version of Hyper-V, exporting that virtual machine, and then importing it into a Hyper-V host. Being able to run Hyper-V on the desktop might also be beneficial to helpdesk staff, because it will allow the helpdesk staff to have a local copy of each desktop image that is used throughout the organization. This can help the helpdesk staff to troubleshoot issues or even test patches. One of the best uses for Hyper-V involves working from home. For many users one of the big disadvantages to working from home using a personal computer is that they often lose a degree of control over their computer. Often times companies require various applications, patches, and system settings to be installed on any computer that connects to the corporate network. When a user connects to the corporate network from a home computer they may be forced to adopt applications and settings that they really don’t want. Running Hyper-V on the desktop gives employees who work from home the opportunity to create an isolated environment from which to connect to the corporate environment. Any changes that are imposed as a result of connecting to the corporate network are limited to the virtual desktop and do not affect the user’s primary operating system. In some cases the corporate IT department might even be able to give the user a fully provisioned virtual machine image that they can simply add to their home computer without going through the trouble of manually creating an isolated environment. Another advantage to connecting from a virtual machine is that it shields the user’s personal data from the corporate network. After all, most people have things on their computers that they would prefer to remain private, and using a virtual desktop can help to ensure that privacy. Although somewhat unrelated, I wanted to quickly mention that Windows 8 does offer another feature that is geared toward working from home. Windows 8 can be installed to a bootable USB flash drive. This feature, which is known as Windows to Go, also allows users to work within a dedicated Windows instance, thereby isolating their personal environment from their work environment. Windows to Go involves booting a dedicated copy of Windows 8 from a USB flash drive and does not make use of Hyper-V.
Another benefit to running Hyper-V on the desktop is that you can create sandboxed environments. We all know that browsing the Internet can be risky. Even though Microsoft has done a lot of work to make Internet Explorer more secure, the browser is still susceptible to certain vulnerabilities. A great way to prevent Internet malware from trashing your PC is to run Internet Explorer within a virtual machine. That way if Internet Explorer does become infected with malware, the infection is limited to that virtual machine. The malware won’t be able to infect your primary desktop or steal your data. Perhaps the best part is that if your browser does become infected, you can use a virtual machine snapshot to revert the virtual machine back to a point in time when it was healthy. This process is much quicker and more secure than trying to manually remove the infection. As you can see, there are a number of different benefits to operating Hyper-V on the desktop. Even though Hyper-V isn’t a true replacement for Windows XP Mode, I believe that the benefits will outweigh this loss in most organizations.